The Coffeevine November 18 Box – Morgon Coffee Roasters Again! Part 3 for The Coffeevine November 18 box, in this post I’ll only write about the coffee from Morgon Coffee Roasters. In Fridays post, you’ve been able to read about the coffee and also what I expect from the coffee. In this part, I’ll share my recipe for an awesome pour-over and Espro travel press as usual. This will be a bit different because I’ve already reviewed this coffee, it’s the same harvest and it’s the same everything. So, unfortunately, I will quote a lot of the text from December the 17th from KaffeBox subscription box. I was looking to find the notes described at the bag “Juicy, peach & floral”. It’s very peachy and juicy, with the recipe below the floral notes of the coffee disappears a bit, but while I was cupping I sure felt a white floral attitude from the cup. I loved it, it wasn’t acidic at all. “Morgon Coffee Roasters are from Sweden, Gothenburg, a couple of hours away from where I live. I think that their bag is kinda weird, I don’t mean anything negative about it, just that it is eccentric and I kinda like it. It’s very wide as well, my fastener for the bag is super wide but actually not wide enough for the bag which is a first. I would also like to know how good this coffee would be with “fika”. I tried it with a dark chocolate with sea salt. Last time it was good, but this was actually better, what a lovely surprise! Great peach flavor with a very juicy body. Altitude: 2 100 meters above sea level. 1) 60g of water blooming for 30 seconds, stir with a bamboo stirrer to get all of the coffee wet. 2) Add 240g of water in a circular flow. With a total brew time at 3:00 minutes. *Note: If you have any coffee remaining in the Pour-Over after 3 minutes, I would recommend using a coarser grind for the next attempt. If the total brew time is over 3 minutes, the coffee is exposed to water a greater amount of time than what I had intended in the recipe. This was very good, it wasn’t better than the Honey processed coffee from Morgon Coffee Roasters but it was as good… The smell was very nice as well, very pure and satisfying to grind while boiling the coffee. If you have an Espro and a Pour-Over… What should you choose to brew with? Do you want a more balanced cup, go with the Espro, you also get a great result every time as it’s impossible to make mistakes. I don’t actually have a favorite here, just do as you please, it’s good with any kind of brewer. 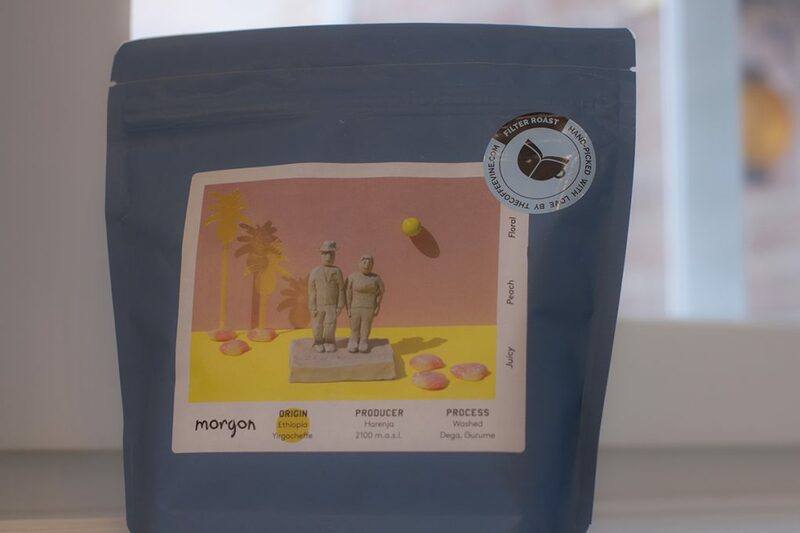 Morgon Coffee Roasters is a new roastery from 2018 and what I noticed after these two reviews are that they are very thorough with everything they do, the roast is very even, the taste is lovely and their notes is the same as mine. Amazing. I would love to see them again.